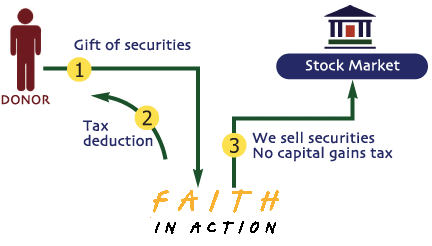 Donating appreciated securities, including stocks or bonds, is an easy and tax-effective way for you to make a gift to Faith In Action. By electronic transfer – Please contact us for instructions on how you can transfer stock or bonds from your brokerage or investment account to Faith In Action. By certified mail – If you hold securities in certificate form, you will need to mail two envelopes separately to complete your gift. In the first envelope, place the unsigned stock certificate(s). In the other envelope, include a signed stock power for each certificate. You may obtain this power from your broker or bank. Please remember to use certified mail. If you have any questions about gifts of stocks and bonds, please Contact Us. Call 757-258-5890 or email bminett@wfia.org. We would be happy to assist you and answer your questions.